1. In a medium bowl, stir together the pork, green onions, soy sauce, garlic, ginger, sugar and sesame oil and mix it all up with your hands. 3. 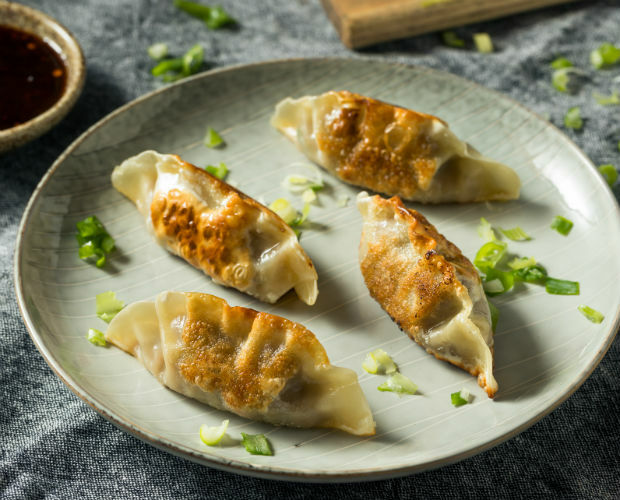 When you’re ready to cook the potstickers, heat a drizzle of canola oil in a largeish skillet set over medium-high heat. Place half the dumplings at a time in the skillet and cook for a minute or two, until deep golden brown on the bottom, shaking the pan a few times to keep them from sticking. Don’t crowd the pan too much. 4. Pour about 1/4 cup stock or water into the pan. Cover, reduce heat to medium and cook for about 5 minutes – this will allow them to steam, cooking them through. Makes 2 – 3 dozen potstickers. Swap coarsely chopped raw shrimp for the pork, turkey or chicken, or go all veggie by sauteeing a panful of mushrooms and chopped cabbage or bok choy until all their excess moisture has cooked off. A potsticker isn't supposed to really stick to the pot—it does at first, then develops wonderfully dark, crunchy bottoms that help them release from the pan and give them so much of their flavour. Let the bottoms get nicely golden first, then pour in some stock or water and cover the pan to allow the rest of the dumplings cook through. It only takes about ten minutes, and you have a batch of fresh, flavourful dumplings that are as fun to make as they are to eat.